On May 6th two Henderson County Ladies Bowling Teams took "The Quill" and arrived in Reno, NV, to bowl in Nationals on May 7th and 8th. 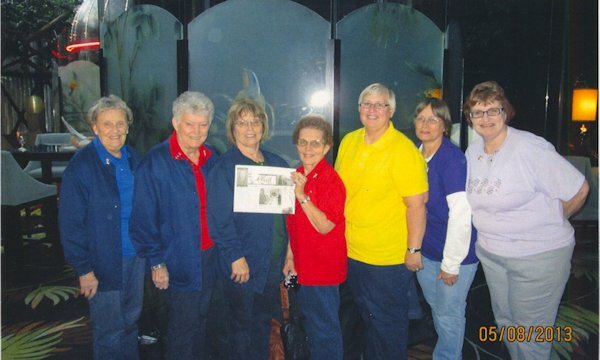 Pictured is Rose Boyer, June Galbraith, Jean Dunn, Pat Dunn, Mindy Henry, Linda Brownlee, and Linda Harrington. In Reno but not in the picture were Donna Hinshaw, Linda Denison and Donna Olson. As usual we had a great time and arrived back home on May 9th. Our photographer was Mindy's husband, Mike. When you go on a trip, take "The Quill" along and have your picture taken with it and then send it to us. Let's see where all "The Quill" can travel.